Navy Fun and a Cupcake Bake Off! exploits! I won’t mention every gig we did this weekend, but our two most notable were, 1) a family fun day at Jim Creek Naval Radio Station in Arlington, and 2) a cupcake bake-off and BBQ hosted by Evergreen United Methodist Church in Lacey. 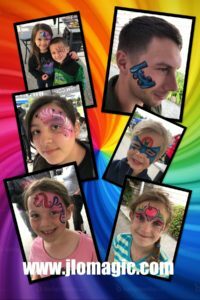 We had to do our fast face painting choices at the Navy event because there were so many kids waiting to get painted, but we received so many compliments on how wonderful the painting was, that the kids and parents didn’t mind that they couldn’t get fullface paints. Here are a couple of photos of some of the work we did there. Thanks to Ryan Leavey for having us out to entertain the sailors and their families! We had a great time! The church bake off was fun, too! John was the only one working that event, but my daughter Johanna, her friend Kadin, and I tagged along since it was an event that was open to the public. We got to do some yummy cupcake tasting, Johanna had fun playing with the huge bubbles they had set up, and all of the kids of Meridian Neighborhood Park had a blast getting some creative balloons made by John. It was a great time. Thanks to Meredith Brown for putting on such a wonderful event and having John out to do some balloon twisting.